Meet Ellen Denny and Patrick Cook. 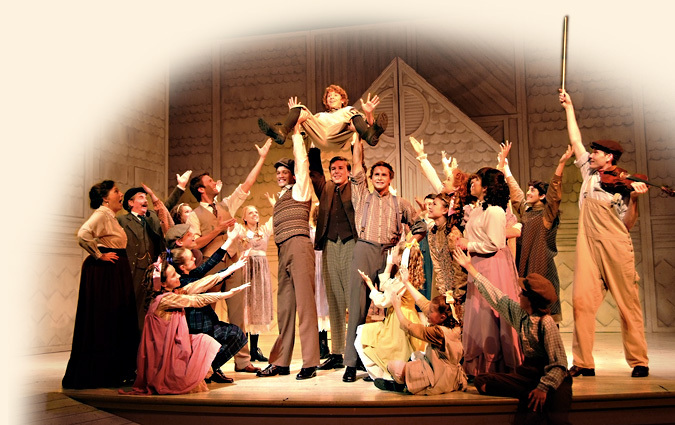 They are the stars of the 2013 production of Anne & Gilbert – The Musical. For her, it’s an exciting new role. For him, it’s a reunion with an old friend. After living in Halifax for the past five years, Denny says she has taken up the nomadic life of a performer. She made her professional debut last summer at Festival Antigonish Summer Theatre, where she performed as Slater in Funny Money, Wendy in Peter Pan, and Athos in Three Munschketeers. She followed that with the role of Johanna in Sweeney Todd, which opened Neptune Theatre’s 50th cheap replica watches anniversary season. Equally at home on the classical music stage, Denny appeared as the soprano soloist in a performance of Handel’s oratorio Alexander’s Feast with the Windsor Symphony Orchestra, in Ontario. Before starting the summer in Charlottetown, Ellen Denny performed in a production of Margaret Atwood’s The Penelopiad at the Citadel Theatre in Edmonton. Nine years ago, Patrick Cook played a young Gilbert in the Charlottetown Festival production of Anne of Green Gables. He returns to the character in Anne & Gilbert – The Musical with Gilbert now a young man seeking his way in the world. “I can’t stress enough how rare it is for an actor to be given an opportunity like this to continue the exploration of a character. I’ve always felt a natural likeness to Gilbert Blythe. He’s a bit of a bad boy with a tremendous heart,” says Cook. Anne & Gilbert beings June 18th and runs until October 13th at The Guild in Charlottetown.